Yes, you read that right. We returned from our over the counter CO elk hunt this year with all our tags in hand ready to make a delicious bowl of sou. But the trip was so much more than that, dare I say still a success? The learning experience was intense. The sense of accomplishment felt while driving out from a trailhead no one else drove after walking out the miles that no one else walked in can only be experienced, not described. I'll give you a breakdown of our trip here as well as my reflections on lessons learned. ALERT: This will be long and rambling!!! This trip started about 8 or 9 months ago with the planning stage involving a trip for Deryder and myself to go on and as it grew and became a reality, the chance that Mike wouldn't make it do to a necessary surgery loomed. Ryan and Daryn hopped on board and we charged forward hoping Deryder could make it until the week of our departure arrived and Mike's absence became eminent. 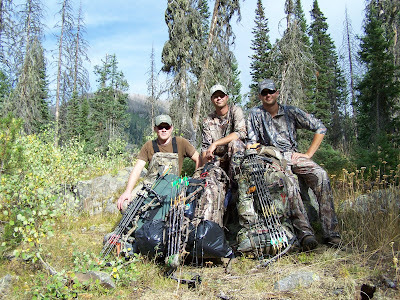 My first lesson of backcountry hunting was learned before I even left home. The intense amount of effort needed to pack and prepare for this trip was more than could be completed in my 2 hrs after work each night, I called the boss, took that extra day off work on Friday to prepare and stayed up until 1 AM Thursday night prepping and packing my gear. 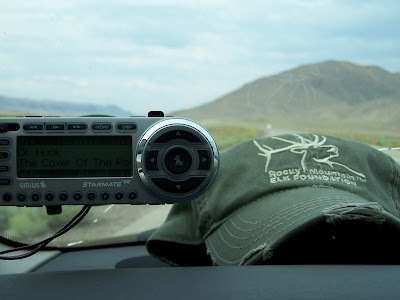 After sleeping in and a late breakfast with the girlfriend, I departed on my 14hr journey to elk country, hoping to meat Dickey and Daryn who had already begun there 20hr drive to our rendezvous point. The drive was no doubt long but the adrenaline and excitement of nearly 8 months of preparation made it easy and, before I knew it, I as there in Steamboat Springs within 20minutes of Ryan and Daryn's arrival. So far the plan was going well, it may be 4AM but everything was going well. We rolled into a La Quinta and got some rest before the 11AM checkout and our official departure into Elkville, USA. Saturday didn't begin until about 1100 with another late breakfast as our official last real meal and my chance to finally share the details of the hunt I'd carefully planned with Ryan and Daryn. You see, I hadn't had a chance to review my maps or discussions with biologists with any real detail with these guys until the morning we were set to take the woods. I felt the entire hunt rested on my shoulders. Was the drainage I'd pick going to be a hit or a dud. Either way there would be no-one to blame but myself. 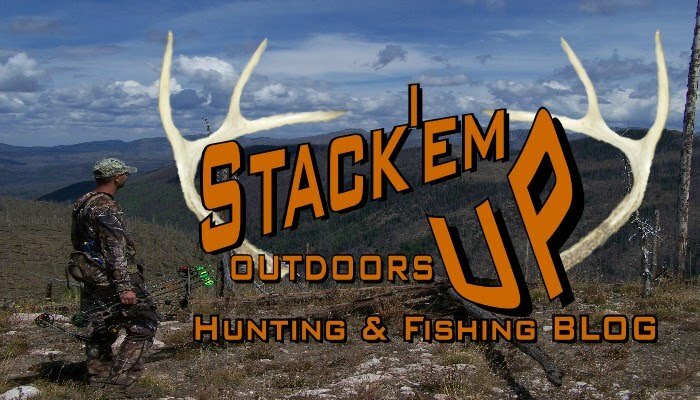 Our entire elk hunt was riding on the map scouting and research skills of a guy who had never map scouted, never researched public land, and never hunted elk. We were definitely cautiously confident. After grabbing Daryn's tag at a local Sports Authority where the lady ringing it up at the register let us know that "you had to get pretty close" to shoot an elk with a bow, we were on our way to the trailhead we'd never seen in the mountains we'd only dreamed of. A scouting trip this far from home with minimal vacation and a demanding job just wasn't feasible this year. Is it possible I could put us on elk from my comfortable office and apartment 1000 miles away? We'd soon find out. 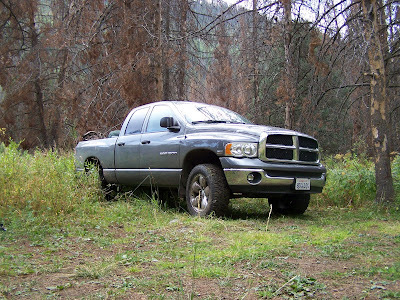 The road in to the trailhead was increasingly difficult and tight, Jeeps are much smaller than lifted RAM 1500s. 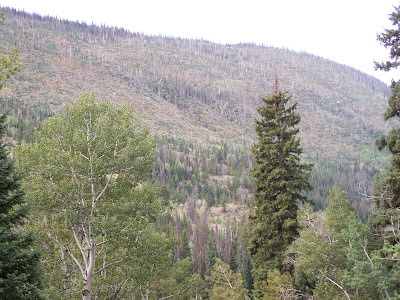 On the way in we passed many experience their version of an elk hunt, usually including outfitter tents and horses. If no horses, they substituted a Quad or two. I was glad we had chosen a Wilderness area for our hunt to weed out most of these folks. No motorized equipped allowed in these parts and hopefully that would separate us from those we passed on the way in. After we took our time getting our gear together and enjoying being the only vehicle at the trailhead, we headed off up the creek drainage from there. Quickly the trip turned from perfectly planned to that "eh?" stage. The trail disappeared into swamp grasses quickly within a 1/2 mile of the trailhead, as we attempted to follow where we thought the trail was supposed to go, based on a Garmin Topo Map on my GPS, we found our selves a couple hundred feet above the creek bottom fighting through the most difficult combination of blowdown and burn I could have ever imagined. Every step required concentration to balance the overweight (we'll touch on this later) pack to avoid tumbling through a shredder of tree tops and granite. We fought on like this for a couple hours before setting down the pac ks on a rock outcropping and looking out over the valley wondering how in the hell we would get where we needed to be at this pace. We reviewed the much more accurate MyTOPO map at this point and realized the GPS map had us on a wild goose chase after a trail that never left the creek bottom and never crossed the creek. After some planning for the morning, we headed to what looked like a clearing below to set up camp for the night as the sun was only an hour or two from setting. After high balling the first camp in favor of getting back on the right side of the creek for the next day, we setup camp on the only, semi-flat semi-dry area. We'd try again in the morning, and hope for the best. This was a sparse camp at best and we would hope for better luck in the morning. Spirits were still high despite the tough day. Heck we'd even taken time to pose for what would later become known as the "Dateline Pohoto" you see below. We had only planned on getting to the trailhead by tonight and, despite a few extra miles under our boots, we had made it a mile or so in with hopes of cutting some time of the next days hike and hopes of a good afternoon of glassing or hunting on Day 2. We were alone in Elk country and couldn't be happier.